Odell Brewing will hold its annual River Appreciation day on April 20. 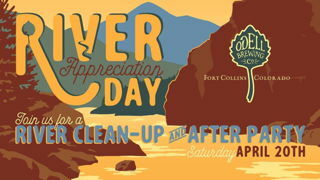 Celebrate Earth Day with Odell’s 3rd Annual Poudre River Clean-Up and After Party. The clean up starts at 8am with the City of Fort Collins Natural Areas. Then join us at the brewery afterwards for a celebratory beer courtesy of Odell’s! RMF will be there with games, raffles, fly tying and fun. Please contact Dennis Cook as soon as possible to volunteer with RMF activities at this worthy event. Colorado TU is proud to announce that our Rendezvous will be returning to the historic Hotel Colorado in Glenwood Springs, CO for a three-day annual membership meeting and elections, special workshops. Join fellow Colorado TU members (new and old), outdoor professionals, guides, educators, and conservation groups for a weekend not to be missed. Find out what projects are being done around the state and how chapters are approaching issues. Make your reservations soon. Deadline for discounted lodging is March 25, 2019 for the April 26-28, 2019 Rendezvous. Get registration and program information at CTU/Rendezvous. At the March, 2019 Leadership Meeting, several changes on our Leadership team were approved. Please welcome these new leaders as they embark on the important work of our Chapter. I want to extend my gratitude to each of these folks for their willingness to take on these important tasks. I would also like to thank Frank Bub, outgoing Conservation Chair, Linda Jefferies, outgoing Membership Chair and Dennis Cook, outgoing Youth Chair for their outstanding work over the past few years in support of our mission. Both Frank and Dennis will stay intimately involved with Chapter volunteer activities and we wish Linda the best as she deals with her illness. For the tenth year in a row, Rocky Mountain Flycasters will offer an award winning, intense, week-long day camp for youths interested in fly fishing and cold-water trout habitat conservation. Youths ages 14-17 are encouraged to apply for one of 15 spaces on March 1, 2019. The camp runs Jul 29-Aug 3. See the Camp page for more information and applications. Topics range from entomology to knots, clothing to stream flow, trout habitat to trout feeding habits, invasive species to riparian watershed restoration, and much more. Dave Morse accepts for PRVFF Rocky Mountain Flycasters President Mickey McGuire (right) presents three L.L. Bean Angler II fly fishing outfits to the chapter’s Veterans Service Coordinator, Dave Morse. The rods will be used by chapter volunteers to teach Northern Colorado veterans fly casting and fishing skills. 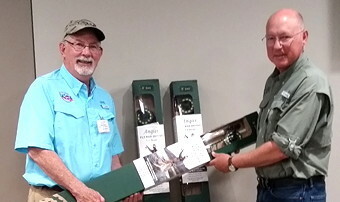 The fly rod outfits were awarded as part of a donation program through Trout Unlimited. For more than 20 years, L.L. Bean has been donating fly rods and reels to TU Chapters. This year, more than 100 chapters applied for the more than 400 donated outfits, valued at nearly $40,000. For more of the story, see our PRVFF page. In the restoration efforts to bring back the Colorado State Fish, Colorado Parks and Wildlife with the help of volunteers are working to assist with spawning efforts. Read the story in the August issue of The Flypaper available on our web site. See also the George Creek Restoration. 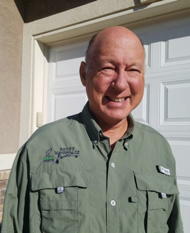 Rocky Mountain Flycasters is now offering special order fishing shirts from Columbia. Both men’s and women’s styles are available in a wide variety of colors and patterns. Get the order form, make your choices and submit your order to get a special discount price on these functional, attractive shirts. We got in a new order of RMF Logo Hats recently. New colors and new pricing. Hats are now priced 25% lower than before. Show your pride in the work of Trout Unlimited and Rocky Mountain Flycasters. Get your hat(s) from our merchandise page and wear it with dignity. What is noteable and quotable? See the brand new Quotes and Notes on the calendar page. Perhaps something you’ve written or said is included. There is a new one for every day of the year. 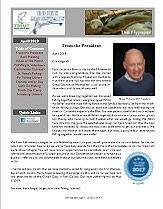 Trout Unlimited has been notified that a company called Platinum Publishing sent out renewal invoices for TROUT magazine for $79.95 to some of our members. Please be advised that this is a SCAM and did not originate from TU’s offices. Please do not respond to these invoices, but rest assured tu.org and our Woolly Bugger, WV, post office box are fully operational, secure and ready to process dues and gifts. Pass this message along to the volunteers in your chapter. RMF has teamed up with the volunteer management system (VMS) company Volgistics to better manage the many opportunities we have to volunteer doing restoration, rehabilitation, and sustaining our cold water preservation mission. Connect with our VMS system on our newly designed Volunteer page. Small can be beautiful. 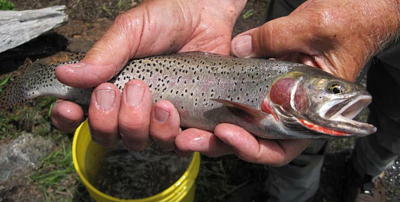 Read Mark Miller’s story Fishing the Headwaters of the Big Thompson River. You can now download our calendar in digital format. See the new Calendar page. You can also download individual fishing events from our Let’s Go Fishing page. What is noteable and quotable? See the brand new Quotes and Notes on the calendar page. Perhaps something you’ve written or said is included. RMF fishing story from Marc McKenzie - Classical Music and Fly Fishing in Aspen. Are you a Sustaining Donor? Sustaining Donors are members of Trout Unlimited (TU), non-members, and businesses who recognize that without this kind of community support our Chapter can not adequately protect, conserve, and restore Colorado’s cold-water fisheries and their watersheds. Sustaining Donors are recognized at various levels. Contributions are greatly appreciated and we acknowledge sustaining donors in multiple ways. Find out more. What else? Want to find out more about what Rocky Mountain Flycasters does in our area? Take a look at the About Us page and download the brochure we prepared. Rocky Mountain Flycasters continues to support the Robert J. Behnke-RMF Research Fellowship through donations for each year’s fellowship and we are actively seeking donations. Read more about the fellowship and you can use this Donation Form to make a contribution. This fellowship helps a Colorado State graduate student with research and honors the life-long contributions made by Dr. Behnke. Stop cross-water contamination! Newly Revised! Whirling disease. Dydimo. New Zealand Mud Snails. Chytrid fungus. These are very real threats to our waters. If you follow some very simple, inexpensive procedures, you can help curb the spread of these diseases. See Common Sense Disinfection Procedure by Phil Wright. Are you as "sure footed" as you would like to be? Are you ready for the spring run-off? The raging spring torrents can quicky take your feet from under you. It could be that you might need a wading stick. Here’s how to build one out of inexpensive/used materials. Phil Wright put together this helpful HOW-TO (pdf 412 KB) so you can have your own hand-crafted wading stick. Is didymo invading your favorite stream? Read Phil Wright’s article about decontamination.